Introduction to aluminium metallurgy. Part 1 Production and casting of aluminium and its alloys: Production of alumina; Production of primary aluminium; Production of secondary aluminium; Ingot casting and casthouse metallurgy of aluminium and its alloys; Casting of aluminium alloys; Quality issues in aluminium castings; Case studies in aluminium casting alloys; High pressure diecasting of aluminium and its alloys; Progress on the heat treatment of high pressure diecastings. Part 2 Metallurgical properties of aluminium and its alloys: Work hardening of aluminium alloys; Precipitation and solute clustering in aluminium: Advanced characterisation techniques; Solute partitioning to enhance mechanical properties of aged aluminium alloys; Vacancies in aluminium and solute-vacancy interactions in aluminium alloys; Modeling the kinetics of precipitation processes in aluminium alloys; Ultrafine grained aluminium alloys: Processes, structural features and properties; Design for fatigue crack growth resistance in aluminium alloys; Fracture resistance in aluminium; Corrosion and corrosion protection of aluminium. Part 3 Processing and applications of aluminium and its alloys: Joining of aluminium and its alloys; Aluminium powder metallurgy; Laser sintering and rapid prototyping of aluminium; Aluminium sheet fabrication and processing; Application of modern aluminium alloys to aircraft; Materials selection and substitution using aluminium alloys. Aluminium is an important metal in manufacturing, due to its versatile properties and the many applications of both the processed metal and its alloys in different industries. Fundamentals of aluminium metallurgy provides a comprehensive overview of the production, properties and processing of aluminium, and its applications in manufacturing industries. Part one discusses different methods of producing and casting aluminium, covering areas such as casting of alloys, quality issues and specific production methods such as high-pressure diecasting. 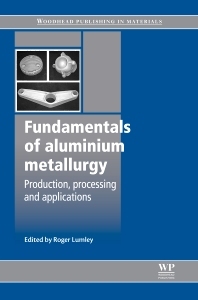 The metallurgical properties of aluminium and its alloys are reviewed in Part two, with chapters on such topics as hardening, precipitation processes and solute partitioning and clustering, as well as properties such as fracture resistance. Finally, Part three includes chapters on joining, laser sintering and other methods of processing aluminium, and its applications in particular areas of industry such as aerospace. With its distinguished editor and team of expert contributors, Fundamentals of aluminium metallurgy is a standard reference for researchers in metallurgy, as well as all those involved in the manufacture and use of aluminium products.